Tomato sauce and cheese on toast has been a well loved favourite in Mum’s and my households for years. Mum also used to make a little afternoon tea/supper snack that was cheese and bacon on toast, but this recipe combines them both. 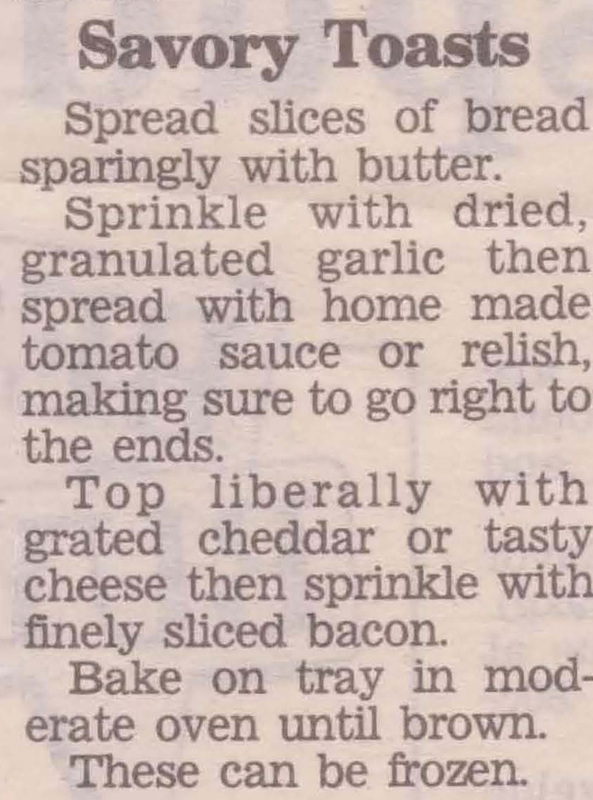 Personally I’m not sure about the garlic, but after finding this recipe I’m now going to give the sauce, cheese and bacon a go. This entry was posted in All Recipes, Nibbles & Snacks and tagged 1980s, bacon, bread, butter, cheese, garlic, savoury toasts, tomato sauce by bebsrecipes. Bookmark the permalink.